A Marketing Funnel consists of the process a visitor encounter before a conversion. Every online business should set up a funnel and drive traffic to it either organically or by paid methods. There stages at which visitors that are actively looking for information can find answers that they are seeking to help them solve a problem. 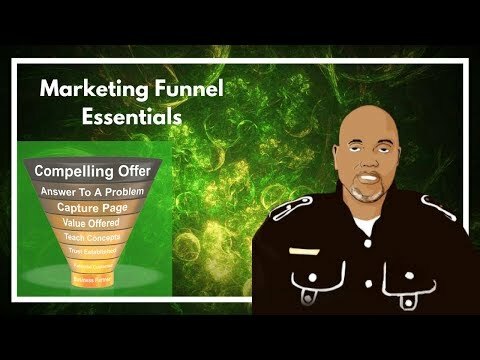 Every marketing funnel has at each stage enough information that will help each prospect make decisions to progress forward by giving solutions in hope that the end results are to make a buying decision. Here in this post, we talk about the steps that will help any business to market effectively and give specific answers to their target audience’s questions. This will always result in long-term relationships and healthier business because you are solving your customer avatar’s problem. The importance of having a funnel in place is to build a know, like and trust with your potential prospects, clients or business partners. Your marketing must be intentional and it should consist of these components. Because marketing and sales work together every company is responsible for doing their research on their market. Knowing how to get in front of customers that want what you are offering is key. This is the science of the marketing sales funnel. So when comparing features and benefits of competitive products you must have a offer to get the initial name and email of your visitor. This in return gives you an opportunity to build a know, like and trust. Also, it will break down barriers to future communication within your email marketing campaigns. Everytime someone types something in a web browser it is clearly to get a solution. You must have that solution with a clear call to action as to how you can answer their questions. This is what makes your marketing effective. You must provide educational content and build a relationship with your subscriber. It must educate them and be helpful to the ideas they have for solving potential future roadblocks. An effective marketing funnel with a pre-written email marketing campaign will bridge more future sales. Continuing to give away free educational content as it will position your brand and give clarity of what you represent. It will also position you as a thought leader in your industry. This stage is directly related to the building of the know, like and trust factor and will create your online business authority. A central hub in place or a Facebook business page can give your online marketing a face-lift. When you send your subscribers & potential customers to your online real estate it will build your brand and establish a future gathering place for more integration. This in return positions you to never have to sell because you will have specific details of product testimonies and other social proof of your integrity. You may find this some help Marketing Versus Sales| How to Get Results. Content is king and the more you learn the more you can answer the most common problems that your target audience is having. It is a must to learn, implement and continue to teach your ideal customer avatar. Having a Sales funnel in place can position you to create more time freedom and this will give you more income and you will never have to ask what is a sales funnel again. Here is an article of a success story of someone who created their first sales funnel and got awesome results. To never miss another post or video of when we are having webinars or challenges click below on the image.